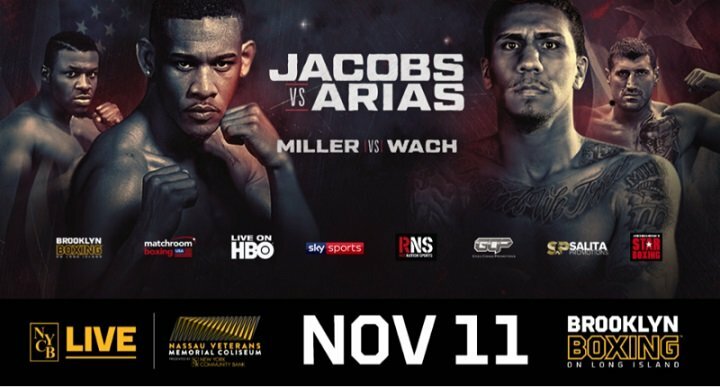 The off-TV stacked undercard has officially been set for the Saturday, Nov. 11 showdown between Daniel “Miracle Man” Jacobs and undefeated Luis Arias at NYCB LIVE, home of the Nassau Veterans Memorial Coliseum and televised live on HBO World Championship Boxing beginning at 10:00 p.m. ET/PT. Leading the undercard is Jesse Angel Hernandez (9-1, 7 KOs), a 26-year-old southpaw from Fort Worth, Texas, who will battle Glenn Dezurn (9-0-1, 6 KOs) from Baltimore, MD. Jesse has 16 siblings – nine boys were boxers and six turned professional, including Jose “El Loco” Hernandez, and Rodrigo Hernandez. Salita Promotions recently signed Hernandez after witnessing an impressive knockout over then undefeated in seventeen fights Russian Vladimir Tikhonov, also a Salita Promotions fighter. Undefeated Connor Benn (9-0, 7 KOs), from Essex United Kingdom, the son of former middleweight and super middleweight world champion Nigel Benn, will battle Highland NY’s Daniel “The Hudson Valley Kid” Sostre (13-14-1, 5 KOs) in a six-round welterweight contest. Benn has fought in some of the biggest venues in the world (O2 and Manchester Arenas); and on the biggest fight cards, (making pro debut on Martin vs. Joshua card, and also the Golovkin vs. Brock and Joshua vs. Molina events). Undefeated New York City police officer Dimash “Lightning” Niyazov (12-0, 5 KOs) will fight in a six-round lightweight bout. Born in Shymkent, Kazakhstan and now residing in Staten Island, NY, Niyazov began boxing at 4 years old. At 13, his family moved to the United States and his father began boxing training in earnest. As an amateur, Niyazov won the NY Empire State Games and NY Metros. He became a member of New York City’s finest three years ago and is stationed in Brooklyn. Shohjahon Ergashev (9-0, 9 KOs), Uzbekistan’s popular 25-year-old four-time amateur national champion will battle Marquis Hawthorne (5-7, 1KO) from Waco, TX, in a six-round welterweight bout. To prepare for his US debut, Ergashev, who has won his last five fights inside of round one, is training at Kronk Gym in Detroit with well-known Javan SugarHill Steward (nephew of legendary Emmanuel Steward). Tommy Rainone (26-8-1, 6 KOs) from Rockville Centre, NY, will have a six round welterweight rematch with Mexican Fidel Monterrosa-Munoz (38-14-1, 30 KOs), inwhich Monterrosa-Munoz won by unanimous decision on July 15. While Rainone began his love affair with boxing at age seven when he saw the movie “Rocky”, he didn’t make his professional debut until age 26. With a loyal fans base that has continues to grow, Rainone won his first eleven professional bouts, including two wins in a five-day span and a third victory 15 days later. Long Islander Tyrone James (4-0, 3 KOs) from Elmont, NY, is carrying the torch of his athletic family and will fight in a six-round welterweight bout. Tyrone’s father, Derrell, was a standout professional football player and his uncle Jerry was a 1988 Golden Gloves champion. Tyrone started boxing at age 10 and went on to have an outstanding amateur career becoming a 5-time Junior Olympic [MG1] champion and Nebraska Golden Glove champion. Opening the action-packed HBO telecast will be super lightweight knockout artists Long Island’s own Cletus Seldin and Roberto Ortiz squaring off in a 10-round bout. In the chief-support bout, exciting heavyweight Jarrell Miller looks to stake his claim on a heavyweight title shot and in his way is Polish giant Mariusz Wach.